As Stephen A. Smith and ESPN reported yesterday Anthony wants to play with LeBron James and James wants likewise, but where they may pair up and join forces makes this story even more interesting. As I sit here and watch Game 4 of the NBA Finals I can’t help but think about the Heat would look with a Big 4. Stephen A. has been on the record from day one saying that these four players would join forces next summer, not this one. That means one more year of Anthony in New York with Phil Jackson doing everything in his power to get him to sign long term. I believe Melo will opt into his the last year of his contract and weigh his options after seeing how much the Knicks actually improve. This afternoon Chris Bosh attempted to dampen the rumors of Anthony to the Heat with a strong statement. So according to Bosh they have not talked YET, and they shouldn’t have considering they are in a tough series with their backs currently against the wall at home tonight as they try to find a way to beat the San Antonio Spurs. This conversation will not happen according to any player until The Finals are over. I do not know if I believe Bosh that this conversation has not come up, but maybe it just has not come up with all three of them present. I do believe the numerous reports that Melo and LeBron have talked about wanting to play together, but when and if that actually comes to fruition is an entirely different conversation. I believe Melo opts into one more year in New York to give Phil Jackson a chance to prove they can turn things around. 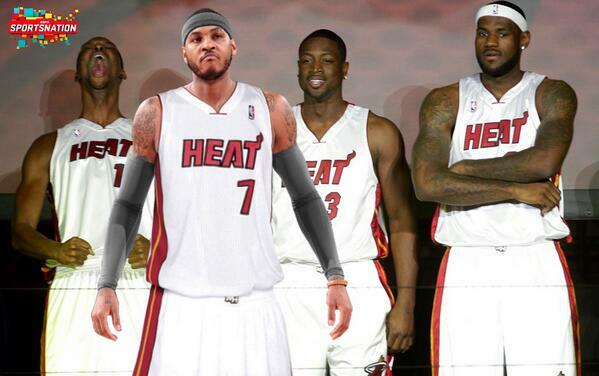 The Miami Big 3 will also opt in in anticipation of making a splash in the summer of 2015. The Big 3 of South Beach will want another chance at their third title after not being able to overcome the Spurs for the second year in a row. Ultimately I think Jackson proves that the Knicks are on the way up to title contention and Melo stays in New York for the long term. New York will be a free agent destination in the summer of 2015 and Melo will be the starting piece in the remaking of the Knicks. LeBron could follow Melo to New York, but I do not think Melo wants to be viewed as LeBron was when he dashed from Cleveland to Miami. So I just want the media to stop what seems like creating headlines and stories when The Finals repeat between the Heat and Spurs has been anything less than headline-worthy. This entry was posted in Draft / Offseason, Home, NBA and tagged Big 3, Big 4, Carmelo Anthony, Chris Bosh, Derek Fisher, Dwayne Wade, LeBron James, Michael Wallace, NBA Finals, New York Knicks, Phil Jackson, San Antonio Spurs, South Beach, Stephen A. Smith, Summer of 2015. Bookmark the permalink.